Substitute Eden Hazard scored a late winner as Chelsea beat Bournemouth to reach the Carabao Cup semi-finals. The match was six minutes away from going to penalties when Pedro’s back-heel gave Hazard a chance, with his shot deflecting off Charlie Daniels and past Artur Boruc. 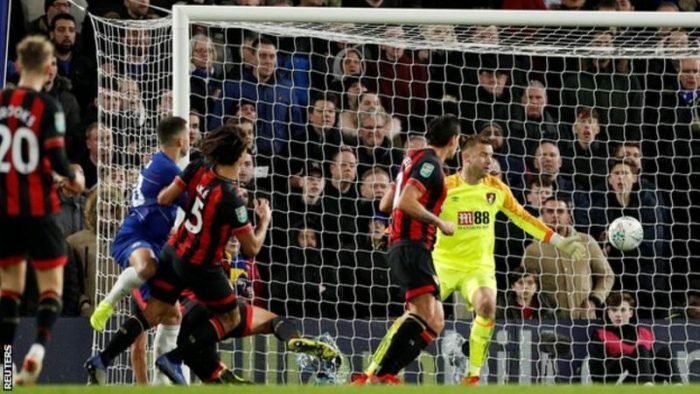 Bournemouth, who were aiming to reach the semi-final of a major cup competition for the first time in their history, had chances but Callum Wilson shot just wide and Lys Mousset had an effort saved by Kepa Arrizabalaga.